In Denmark there is a thriving science fiction subculture with many short stories being written every year. 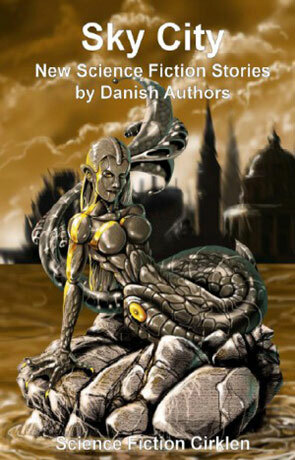 Since 2007 the Danish science fiction association (Science Fiction Cirklen) has published an annual anthology of a selection of these original stories, written by Danish authors. For the very first time a number of these short stories from the first two anthologies have been translated into English and made available through the Sky City anthology, providing a unique insight into a different cultures take on science fiction. The anthology has been edited and compiled by Carl Eddy Skovgaard along with the team at the Science Fiction Cirklen and they hope to show the English speaking world that science fiction is a truly international genre, even being written in small European countries like Denmark. The result is an incredibly rich and diverse collection written by some highly talented authors, while the translation is superb - for 99% of the book you just wouldn't know that the stories were not originally written in the English language. Some of the tales do differ in style a little to their British and American counterparts, with a few exceptions there is a less agressive feeling and a more frank and open narrative than much of the British work. I loved this glimpse into the science fiction culture of a different country and it just goes to show that there is a wealth of talent for writing scifi in Denmark. This first story features the Sky City of the title - a massive structure that stands over half a mile high and built entirely by nano-bots who are still present within the walls - hibernating until the time comes that they need to carry out repairs. But there is a lot more than meets the eye to this spectacular building, and it's up to Romi the "stuff hunter" to solve the mystery. A very interesting tale, told in an uncluttered and well narrated form along with an intriguing idea that is well played out. This short story tells the tale of the preparation for the first manned mission to Europa, one of the four Galilean moons that orbit the planet Jupiter and one of the most massive objects in the Solar System outside the Sun and the eight planets - larger even than any of the "dwarf planets". With a smooth surface of ice there is a theory that beneath that icy crust lies an ocean of water and if that is the case then the moon has a good chance of hosting extra-planetary life of some kind. A very short and sweet tale, with a very relaxed and elegant prose there isn't a whole lot of actual content but what's there works well and I would be interested in reading more of what promises to be an interesting story. The white Bear is set in a future version of China and is as different to the first two tales as China is to Denmark, a racier and more energetic story with a more adult flavour and a much more violent protagonist - a hired goon who hunts down young women in a society with a slave-run underclass that has sprung up due to the largely sterile, ageing population. A goon with a feared reputation and known widely as "the Bear" you can't help but be drawn to this larger than life character and the tight, dry narrative is excellent. I loved the decaying, dystopian feel to this story and the use of colloquialisms when referring to the slaves is a very interesting way the protagonists use to de-humanise what they are doing. There are some very serious and sober ideas presented without any form of judgement and the quality of writing is top notch. This short story gives an insight into just what could happen if nano-bots and other forms of advanced bio-technology escaped into the wild and took hold, while it fall's a little short of the imagined terror of the "grey goo" (although a "Mr Grey" does make an appearance) it is nethertheless a sobering thought and a lessen that we should be careful to tinker with things that could quite easily wipe us out. A thought-provoking post-apocalyptic vision that deals with the collapse of society and the resultant struggle for survival, written with a strong voice in an intelligent manner. A short and bittersweet tale of an astronaut landing on a new, alien planet - ready to colonize it for the human race, but things are rarely as simple as they seem. This was one of my favorites, it's got just the right touch of humour and intelligence, a great little story. Here we have humanities first contact with an alien organism, not by landing on other planets or little grey men visiting earth but by the discovery of a capsule containing a hibernating creature that could have been sleeping for thousands of years. For such a short tale, this story has an incredible power about it, a sense of wonder that the classic science fiction stories were so good at evoking, along with an idea that was used in the recent award winning novel The Dervish House. Set within a military facility in the USA, The Tourist is very much an American military story (which contains a nice nod to the classic TV series the X-files) - a high ranking officer causes a military aircraft to detour from it's course and release missiles into an unpopulated area - but why would the Colonel destroy a successful career and just what was his plan? A descriptive and visually acute story that would make a perfect TV episode or even expand to make a film. We are back in Norway for this story, set 50 years after the War on Terror begun and the world is a very different place where paranoia has grown big brothers reach to include the monitoring and control of people's very emotions and psychological behaviour. Very short story but nonetheless a great idea well executed. A story about the dangers of genetic manipulation, meddling with nature not to cure a horrific desease or beat cancer but for vanity with an undlying theme of racism and the dangers of communism. Intelligent and thought provoking and yet simple and clearly written. A race of people on the brink of despair, a world on the edge of destruction find hope in a strange machine unearthed while digging for new gas, a machine that seems to be able to transport people across the cosmos to an unknown destination. The clamour of people to use this technology - to escape the known depair and travel to the unknown - causes a three month queue littered with hundreds and hundreds of bodies and civilisation continues it's self destructive journey. One of the less cheerful stories in this anthology but nonetheless very powerful and emotive. This is the tale of the aftermath of a Godzilla like attack from a regenerated Dinosaur, thawed after 70 million years in the ice. An interesting idea on how people manipulate events to their own ends, cleverly written in a clear and distinctive voice. We are back in the USA for this short where an alien ship has landed, taking most of New York's Central Park (and a number of people) out as a consequence. The beginning of this story feels very much like a tribute to Stephen Spielberg's classic tale of first contact "close encounters of the third kind" but manages to distinguish itself as something quite original with a tongue in cheek humour that grows into a mashup / sendup of a number of science fiction first contact films and the aliens demands are laugh out loud funny. Another favourite in the collection, I loved the whole upset caused by that classic line "take me to your leader" (think about it). The E-Puzzle gives us a glimpse of personal future technology, in built communication, computers along with retinal screens, recorded memories and even an artificial version of the After-life. This is probably thr most futuristic story in the collection, it's also very well written and I'd love to see it made into a full novel. This little story is essentially all about an alien biology, the crew of a ship presumably in orbit around an alien planet performing an autopsy and learning about the alien physiology. There narrative is quite jumpy in places and moves forward ant a breakneck speed but the prose itself is both descriptive and lucid. The characters are interesting and there is an underlying adult theme with a clinical research vibe running through the story. I love how this story seems very ordinary without any tropes of the genre at all, just two people enjoying each others company (admittedly one more than the other) while clues are dropped along the way it isn't until right at the very end that the actual science fiction idea is revealed - Short and (bitter)sweet. Dreams of Stone presents us with a claustrophobic vision of a huge future city, and one person's journey to escape the madness - the bustling crowd's and lack of space, a journey to see blue skies and green fields. There is a helter skelter feel about this little story and the drawn in, claustrophobic feeling is well portrayed, inciting an oppressive almost panicky feeling. It ends with a sense of irony that the character gets a very different sense of release than she was looking for. The Green jacket tells' the story of a child trying to hang on to things despite the yearly "cleansing" where everything is burnt. Known as "spring destruction" it's supposaed to allow old things to fade and allow new to take off. I wouldn't be surprised if it was an idea invented by the supermarkets to increase sales. A nice little tale told from the viewpoint of a child. The sun has shrunk and the world is an ocean while the only intelligent survivors are fish people, swimming the cold oceans. The first time I have ever read a story from the point of view of a fish, a highly amusing and intelligently told brief tale. An unusually structured short story in the form of a conversation between a detective and a victim of a crime, thoughtful and well constructed, I found it quite compelling. The conversation seems both organically driven and yet with some form of structure. I especially liked the idea behind the story, it even includes the name of my youngest son. Written on 29th August 2011 by Ant.